Home » Australasia » Why we loved New Zealand. We loved New Zealand. Absolutely and totally loved it. It was the most consistently beautiful country I have ever been to, the people were incredibly friendly, the Kiwi dollar is worth next to nothing so it was much less expensive than expected, there are 10x more sheep than people, there is free wi-fi (and wedding magazines!) in almost every public library, the sub-of-the-day only costs NZ3.90, and their wine regions are compact enough to bicycle around, among many other wonderful things. 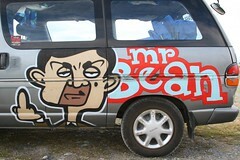 Though we spent a few days in Christchurch our NZ trip felt like it really started when we picked up Mr. Bean, our campervan. If you haven’t ever heard of Wicked Campervans they are basically an old van with the back seats ripped out and replaced with a convertible bed/table and a small kitchen. They are also highly obnoxious – they are spray painted with sketchy quotations and brutal drawings. The worst one ever was spotted by Jon in Melbourne “You say tomato, I say f*** you” with HUGE F*** YOUs along the side of the van. (Not with “*’s” either!) Needless to say we were a little worried about our van but lucked out with Mr. Bean. Other than the left hand side of the van having a huge spray painted Mr. Bean flipping the bird to innocent bystanders, it was actually pretty tame. But can any one tell me what “Ringo… Is the Fonz” means? That was our quotation. I still can’t figure it out. After we picked up the van we set off on our three week camping tour! We weren’t quite sure of much about being in a campervan – least of all where we could do free camping since we weren’t prepared to pay $25 a night for a campsite, but we were soon to be schooled in the art of finding places to sleep for free. At about 9pm our first evening we drove up to beautiful Lake Tekapo where we saw several campers on the side of the lake. So, we pulled over and determined that no one was really supposed to be there… but we decided that there was safety in numbers and joined the group! This lake was an amazing place to start our epic road trip. This is also the start of the list of strange, dare I say ‘exotic’, places we slept, including: Department of Conservation (DOC) parking outside of multi-day hikes, parking garages, lake-sides, several parking lots outside of tourist attractions, and one actual campsite. 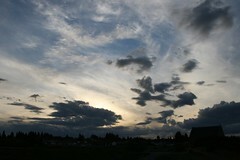 Surprisingly, no one ever bothered us about our free camping and more often than not the other free campers were kiwis! New Zealand’s South Island is chock full of some of the best scenery ever, and it just keeps going! Basically for 10 days we drove through mind-boggling beauty. If it wasn’t breathtaking, chances are it would only last for a few minutes before you would turn the corner to discover another amazing sight. Some of the highlights of the South Island included the famous Milford Sound as well as Wanaka & surrounding area. It was following the spectacular Rob Roy Hike near Wanaka that we picked up the best hitchikers ever! Best because they were non-threating (a girl about our age and her mom) and also because Sally, the daughter, invited us to come stay with her and her boyfriend Rob when we arrived in Auckland about 2.5 weeks later! The South Island is also the home of the Marlborough Region – this region doesn’t cater to smokers as it’s name would suggest but to another common vice. NZ Marlborough white wines are becoming famous around the world. The region is extra good because it is quite small and we were able to rent bikes to tour the wineries for the day. I must say wine tours by bike are by far the best type of wine tours! Cycling up to (yet another) beautiful cellar door, doing a tasting and then hopping back on your bike and repeating is a great way to see the area. We managed to stop at 10 wineries and a spirits distillery during our time in Blenheim! Next up we crossed over to the North Island. Though not as spectacular as the South Island there are certainly many beautiful things worth visiting. This is also the volcanic part of NZ meaning geysers, steamy lakes, bubbling mud pools and hot springs! The capital city of Wellington, just across the straight from the South Island, is a very appealing city and it’s award winning Te Papa museum includes a colossal squid – well worth a visit. The natural highlight of the North Island was certainly Tongariro National Park. This is the location of the most famous day hike in NZ, the Tongariro Crossing. Since we weren’t interested in paying $30 each for a transfer to and from the start and end points of the day hike, we chose instead to do an out and back hike up Mt. Ngauruhoe, a conical volcano. This was probably the hardest hike I have ever done but the views from the top made it totally worthwhile. Basically once you start up the volcano it is a straight up scramble to the top. The whole side of the volcano is simply loose gravel and sand and therefore in every step you take you lose about a half step worth of ground. Despite the difficulty in getting up the volcano the sense of accomplishment at the top is incredible, the views are simply amazing, and going down is SO easy! Jon basically ran down the whole mountain! The next day Jon decided it was time to jump out of an airplane [editor’s note: Jon had had enough of Al at this point]. Taupo is probably the world capital for skydiving and accordingly the price is right and they let you jump from 15,000 ft! He loved it, and I didn’t really like watching, but was very glad when he made it back alive. After this we did a much tamer activity… Segway riding! Then, we ticked the boxes on sights to see in the North Island including Rotorua and the Bay of Islands (where we finally hired a jetski for a 1/2 hour) and spent our last three days in Auckland. As you may recall from earlier in this post – our hitchiker Sally had invited us to stay with her when we came to Auckland. We took her up on this offer and had a wonderful time with Sally and her boyfriend Rob in Auckland. They are English but have been living in NZ for about three years. They were wonderful hosts and we got on really well! It was a really nice way to spend the last three days before setting off to “travel” again. If you are reading this – thanks guys! All in all, NZ was a wonderful country to visit. It is right up there on my list of best places we have been and I would recommend it for anyone looking for somewhere amazing to spend a holiday! And, with the NZ dollar being really low once you get there it is a pretty affordable vacation! I have so so much advice to give (we actually just gave a three week itinerary to some people we met a few days ago). Send me a facebook message before you go and I’ll tell you how to get to the highlights! Mr. Bean was special that is for sure. Is your brother still there? I love that it is you guys doing this trip which means outstanding organization which I can later mooch off of and take the benefit of without having to actually do myself. I will definitely be in touch before I make any definitive plans. And yup, my brother is still in Christchurch.